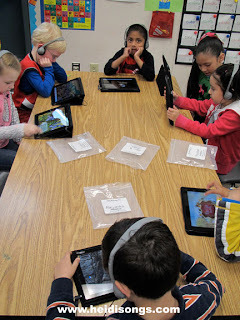 Last spring, I was fortunate enough to visit Trost Elementary School in Oregon that is using iPads and iPods in one-to-one situations at every grade level! This school has done so much with mobile technology that Apple now sponsors classroom tours through their school for educators. As luck would have it, it also happens to be the school that my husband’s sister, Julie Johnson works at as an Intervention Specialist! So my husband and I flew ourselves up to Portland, and then drove south for about an hour to Canby, where the Canby School District is implementing some very BIG ideas in technology in a beautiful small town setting. After that, we had a chance to catch up with his “little sister” and her husband that we really don’t get to see often enough. What a wonderful “excuse” to visit Oregon and his family! In addition to these groups, there was another group with the teacher behind the camera. The Apple Mobile Technology Classroom Tour started out with a presentation by Joseph Morelock, Canby’s Director of Innovation and Technology. It was extremely interesting and informative, and I enjoyed it immensely! I don’t have too much time here to tell you all about it, but I think you can find out about their many successes here on their Blog or their Tech Info Wiki. Also, the achievement data for the classes that are using the mobile technology is really impressive! You can view the data by visiting their blog and clicking on the link for the iPod Achievement Data. One Kindergartner Learns on His iPad. The biggest question most people have when I tell them about the program that I saw is “How did they fund it?” That certainly was my first question! My sister-in-law Julie explained that they decided to purchase technology rather than curriculum, and then work together to create their own curriculum that they would need to meet the standards. So rather than spending many thousands of dollars on, for example, a Harcourt Brace adopted language arts program, they used existing materials and then supplement by creating their own materials together. This allows them to spend the rest of the money on mobile technology such as iPads and iPods. Each teacher was also given an allowance to spend on apps from the iTunes App Store. When the teachers decide what they want, they let their administrator know and then it is purchased in bulk and installed on their devices for them. How many iPads do they really have? One thing about the program that caught my attention was that they did NOT have one-on-one devices in every single classroom by any means! The teachers that were chosen for this program were chosen from a pool of teachers that applied for in-district grants for technology money- about $2000 each. Then, when the quality and innovation of a certain application caught their eye, they would decide to give that teacher enough devices for the entire class, rather than just enough for the $2000! Talk about hitting the jackpot! This is great for the teacher that gets it, but it made me wonder about jealousy issues and inequity issues coming up amongst staff members. It also made me wonder about the possibility of teacher evaluations based on student test scores, and what would happen if one teacher had a much better evaluation due to having better test scores due to better equipment. However, none of this seemed to be a problem to the staff members that I talked to; they all seemed very positive about the programs in place and happy about them being implemented at their school and district. 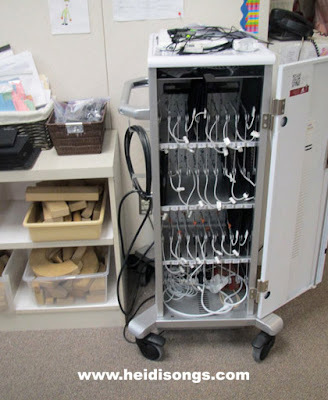 As of 2012, the Canby School District has 4,750 students, 1,840 student computers, 850 iPads, and 1,920 iPod Touches. We were told that of the 850 iPads that they had last year, only one got lost and just one was broken. The children were so engaged that they barely noticed the 5-10 visitors in the room! Of course, being a Kindergarten teacher with a special interest in the use of iPads in the classroom, my main area of interest was the Kindergarten classroom and its one-on-one iPad program. So my husband Greg and I went to the Kindergarten classroom first to check out their program. The old meets the new: wooden blocks next to the iPad storage cabinet! Because Trost Elementary School serves many Spanish speaking children, they have a very popular dual immersion Spanish/English program that begins in Kindergarten and runs all the way through fifth grade. 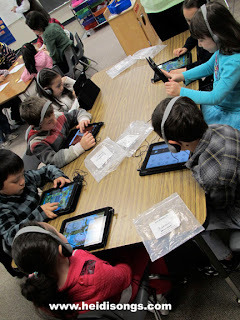 And it was this dual language program that was given the one-on-one iPads to use in the Kindergarten program! There were some children in the class whose primary language was English and many whose primary language was Spanish; however, it appeared that all of the children were being given their reading lesson in Spanish with the teacher. The children were taught in Spanish in the morning and English in the afternoon. However, while we were there, the children were using apps in both English and Spanish. (Apparently there is a real lack of quality apps in Spanish.) My sister-in-law tells me that by the end of fifth grade, all of the children are able to switch back and forth from English to Spanish quite easily and can read and write in both languages on command! Years ago when I first started teaching, I taught a bilingual first grade class for five years, so I found it interesting to watch in all of the classrooms. 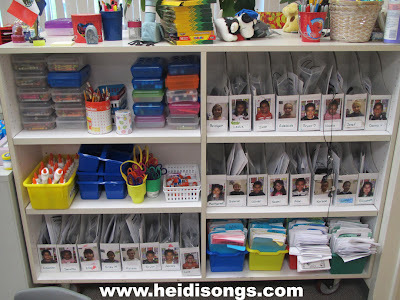 When we entered, the Kindergarten teacher had divided her class into four groups. One group was with an instructional aide that was giving a lesson; another group was getting a reading lesson with the teacher; and the last two groups were at two separate tables and were working with their iPads independently. They were all doing fine with it, of course! Each child had a set of headphones on, and this helped greatly in keeping the noise level at a minimum. 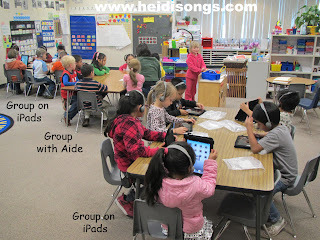 With this type of classroom management arrangement, the children spent two different group times on their iPads. Headphones are cleverly stored in zip bags with pictures in magazine racks, right there with all of the other supplies! I talked to the teacher later during her recess break, and she told me that she had the apps that they could work on for the day in a special folder. She had taught the children to find that folder and work only on the apps that were in it. I wondered if I would see any children straying from the designated apps in this folder to do something else, but I never did! They all were following her directions beautifully, with no behavior issues or any technological issues that she had to deal with in the middle of her lesson. The teacher said that it is no harder to teach them how to use their iPads than it is to do anything else, and they adapt to the rules and how to get them out and put them away quickly. The children line up to put their iPads away in the correct numbered slot. I did notice that some of the children seemed to switch frequently from one app to another, though, within the folder. I’m not sure if it was simply that the apps were not holding their attention very well, or if they just wanted to explore everything in the folder before deciding what they wanted to do the most. But there was quite a bit of switching from one app to another. My Kinders do this too, and I assume that it is a result of their itty-bitty attention spans! Giving them more than one app to choose from during a session is a good way to deal with that sort of problem. The children also put away their headphones. Devices are charged in the storage rack. I stayed in the Kinder classroom long enough to see what would happen when the children transitioned from one group to another. Each iPad was numbered and had a slot where it should go that was also numbered. The children were trained to put their device in the correct slot. Then they found a zip bag with their name and picture on it, and put their headphones in it. 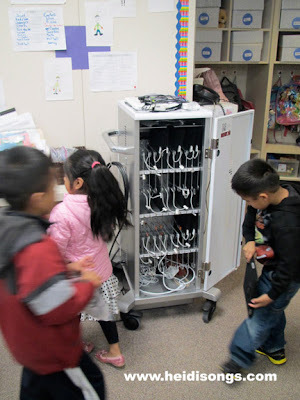 There were numbered slots for the headphones as well, and the children put them away too. 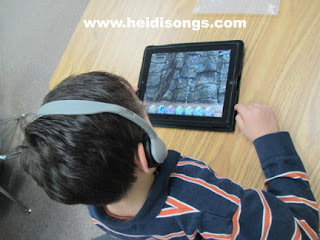 Then the next group got their own iPads and headphones and continued on with their turn on their devices. There was a lady that was helping the children with the transition, and we assumed her to be a volunteer. However, she didn’t seem to be helping them at all with the iPads during the group time. It just didn’t appear to be necessary! And I can imagine that this is true; my students rarely need help, except when they are having trouble sharing the iPads. And in this case, this wouldn’t be an issue! A volunteer helps attach the cords to recharge the iPads. * No need for white boards or dry erase markers. The children can just use their iPads and write on the white board app! 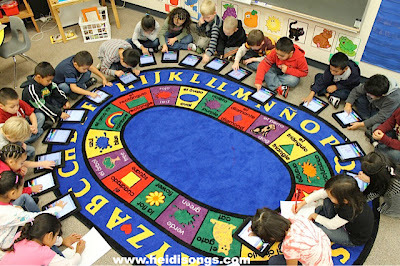 * Every child can easily see photos and videos that you put on the iPad, and participate in discussions about them. * No need to purchase, color, construct, laminate, set up, or tear down elaborate learning centers; just give them apps for whatever you want them to work on and let them go. * No need to waste any paper for practice writing equations, shapes, or numbers, or letters! All of the children can write them on their iPads, and erase easily. Nobody needs an eraser! * Imagine being able to simply take away the iPad from a child who is misbehaving or refusing to pay attention, and giving him or her a pencil and paper instead! Do you think he would try a little harder to follow directions next time? * Imagine giving your students apps that would challenge them and let them learn and grow at their own pace, rather than trying to keep everyone on the same page on the same day? This picture was taken on another day when I was not present. Looks like a dream, doesn’t it? Are you ready to give it a try? I am!!! Now if I only had the power to set this plan in motion and make it happen at my own school!! Great iPad Apps for Pre-K and K! Teaching CVC Words: What to Do When They Are STILL Not Getting It! I regularly review apps and tell how we are using them in my Kindergarten class. Sign up for our email updates and follow my blog to make sure that you don’t miss any! Follow me! Did you enjoy this post? Do me a favor and share it with your friends! And follow this blog by signing up email updates, or follow on Bloglovin’, or follow me on TPT! I’m also on Pinterest, Facebook, Twitter, Google+ and YouTube, too! Don’t forget to sign up for our email newsletter (on the left sidebar) for special deals and promo codes that you won’t find out about anywhere else.